What is Fascia and Why is it Important? 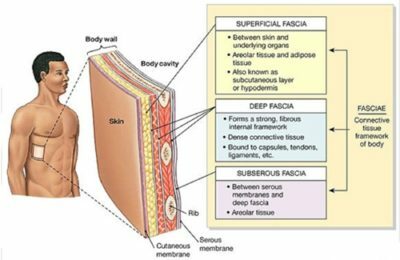 What is Fascia? Why is it Important? Have you ever heard the word fascia? If you’re an athlete, you may have. If you’re not, you most likely haven’t. If you’re a Pro Chiropractic patient, you most certainly have! It is one of the most ignored and misunderstood systems in the body…and it is also one of the most important. It is EVERYWHERE!!! You can’t escape it in the body. Believe it or not, it is one continuous structure from head to toe without interruption. It is the framework for all connective tissue. If you were to remove all non-fascial tissues from your body, you would still have a 3D model of what you look like. Cool, huh? There are three different kinds: superficial, deep, and visceral or subserous. 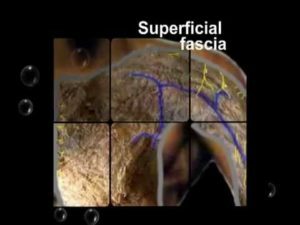 Superficial fascia is actually a part of the skin. It is the lowermost layer of skin throughout most of the body and is responsible for creating the shape of the body. You can find it surrounding glands, organs, neurovascular bundles (groups of nerves and blood vessels that travel together) and basically any space unoccupied by other structures. It stores water and fat, serves as a passageway for lymph fluid, blood vessels and nerves, and can act as protective padding to cushion and insulate. Deep fascia is a layer of fibrous connective tissue that surrounds individual muscles and also separates muscle groups into compartments. For example, the lower leg (calf region) is separated into four fascial compartments: anterior, lateral, superficial posterior and deep posterior. 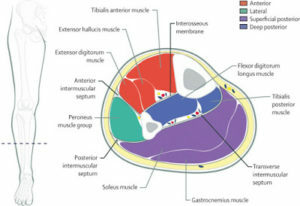 The anterior compartment contains the tibialis anterior, extensor hallicus longus, extensor digitorum longus, and peroneus tertius muscles. The lateral compartment contains the fibularis (peroneus) longus and brevis muscles. The superficial posterior compartment contains the gastrocnemius, soleus, and plantaris muscles. The deep posterior compartment contains the tibialis posterior, flexor hallicus longus, flexor digitorum longus, and popliteus muscles. The fascia that separates the compartments can also be called intermuscular septums. Deep fascia is made primarily of elastin fibers which help determine the extensibility and resiliency of the tissue. It is primarily avascular which means it has no blood supply. It does, however, have a high density of sensory receptors including mechanoreceptors which respond to a physical stimulus like mechanical stress or strain (movement), proprioceptors which give position sense or tell your brain where your body is in space, and nociceptors which respond to damage or the threat of damage thus triggering the feeling of pain. The visceral or subserous type provides suspensory elements to organs in their cavities. Each organ is surrounded by two layers of fascia which are separated by a thin serous membrane. The outer layer of organ fascia is known as the parietal layer. The inner layer of organ fascia is called the visceral layer. This is actually the skin of the organ. Visceral fascia may have different names depending on the organ it belongs to. For example, in the heart, it is known as pericardia. In the lungs, it is known as pleura. And in the abdomen, it is the peritoneum. Visceral fascia must maintain its tonicity due to the suspensory component thus it is considerably less extensible than superficial fascia. If the tonicity is compromised, organ prolapse can occur. If the tonicity is increased, organ motility (like intestinal digestion) can be limited.